Philipe V. Roy d'Espagne. Buen-retiro. Hermitage de S. Antoine. Entree du Palais Royal a Madrid. La Place Major, de Madrid. 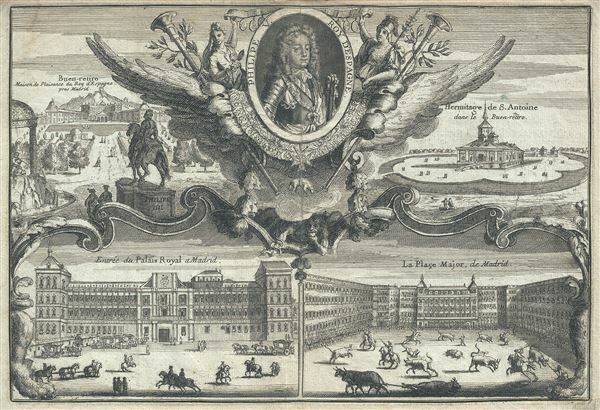 This is a fine 1701 view of the Royal Palace, Plaza Mayor and the Buen Retiro in Madrid, Spain, by Nicholas De Fer. This beautifully engraved view includes a portrait of Philip V, King of Spain, surrounded by an elaborate and beautiful cartouche. The upper left quadrant of the map includes an illustrated view of the 'Jardines del Buen Retiro' or the Gardens of Buen Retiro. A view of the Hermitage of San Anthony, located within the Buen Retiro, is featured in the top right quadrant. The Buen Retiro, a complex originally built as a second residence by Philip IV or Spain. Only part of the palace grounds remain today and it is one of the largest parks in Madrid. An illustration of the Royal Palace is featured in the lower left quadrant of the map. In the foreground carriages and riders can be viewed. The lower right quadrant illustrates the Plaza Mayor, with scenes of bull fighting in the foreground. This view was issued by Nicholas De Fer in his 1701 Atlas. Very good. Minor wear along original centerfold. Original platemark visible. Minor dampstains in margins.